Event extended till November 15th. Diwali, is always enjoyed with New Dresses, Crackers, Sweets and Snacks. During my Childhood,When we were in Villiage before moving to the town, We will have a Cook, and prepare many sweets in the backyard. I will be sitting next to my Great Grand mom and watch making Jangri's, Athirasam and all. Eating Hot Jangri's is Divine and i still remember its Taste. All the Sweets and Snacks will be stored in a Thooku(A container with Handle) and made to hang from the ceiling. its to safeguard the sweets from Ants. But after Moving to Pondicherry, it was a small house and every sweet container will be stored below my bed. so whenever i feel hungry, will take a Athirasam and eat. when the sweet tooth gets bored, i will pick murukku. it will all happen in my study time. As Diwali is just a week away, i know, many of you all will be preparing Sweets and Snacks for Diwali. So just send me your Sweets and Snacks to me. It will be nice to see, how you have packed the sweets and snacks in a box, to gift to your dear friends and family. you can also give your ideas on Gift Packing. You need not restrict to Indian Sweets and Snacks. Send me Baked Goodies also. Send in your entries by November 15 nth to glassofhoney@gmail.com . Here are the Simple Guidelines for Diwali Sweets and Snacks Event. Rule: Please dont send store bought sweets and snacks pictures. (a) Prepare Sweets , Snacks and picture it. (b) Feel Free to Post as many Sweets, Snacks Recipes as you like on your blog. (c) Link back to this event announcement is a must. (d) Use of the Logo to the event is also appreciated. (e) I will also accept your old post’s, but you should link back to this announcement post. Re-Publishing old post’s will make me more happy! with SUBJECT as Diwali Sweets and Snacks along with the following details.. Attach a Picture of the Dish. Size does not matter. (g) Deadline for all the entries will be the 15 nth of November-2010. I will do the roundup as soon as possible..
(h) If you don't have a blog, but you want to be part of this wonderfull event, you can send me your Recipe along with the picture of the dish. Dont forget to mention your name and your location. So Iam eagerly looking forward for your entries. If you need any clarification’s on the above feel free to mail me glassofhoney(AT)gmail(dot)com or leave a comment below. To Make me Eat Fruits will be very tough. My father and me used to have fight on it. the same continues with my husband also. But when my son feeds me any fruits, i will eat. We are Strange Mom and Son! But I love to eat Vegetables. 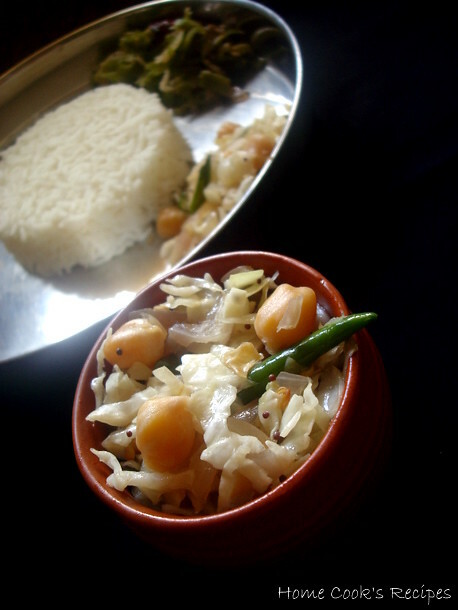 My meal starts of with small quantity of rice and more vegetables(poriyal). I cook this atleast once in a week. This Broad Beans have good fibre content. without googling, thats what i know about the vegetable. Trim the head and tail part of the Avarakaai / broad beans. Wash them Thoroughly & (Naar edukkavum). and chop them into small pieces. Add a 1/2 cup of water to the chopped avarakaai and boil them for 3-4 minutes. 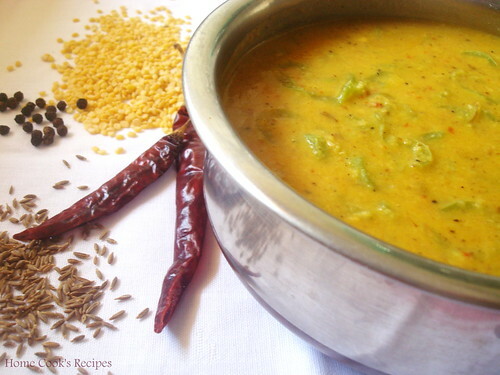 Heat Oil in a Pan, add mustard and let it splutter, add urad dal, red chilli's and curry leaves and roast them. add the cooked avarakaai without any water to the pan and give a stir. add salt to taste and grated coconut to the pan and give a stir. Remove from the flame and serve with Hot Rice and Ghee. Have Pressure Cooked Chickpeas Ready. Chop the Onion and Cabbage finely. Heat oil in apan, add mustard & let it splutter, add urad dal, curry leaves , slitted green chilli and roast them. Now add chopped onion and fry till they turn transparent. add the chopped cabbage an give a stir. Add boiled chickpeas an salt to taste to the pan an give a stir. switch off the flame and serve for vathakuzhambu or sambhar rice. 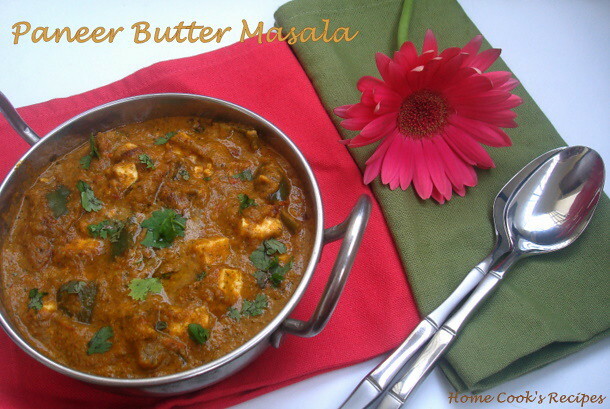 This Paneer Butter Masala Recipe is a very simple one, yet it never disappoints you. even if you are going to try this for first time, it will come out good. my mom prepares this paneer butter masala so so good. whenever she prepares on weekdays, she stores some for me in fridge and i will feasting on it when i come home from hostel on weekends. This recipe has very few ingredients with no masala and spice ingredients. you cannot omit butter, as thats what enriches this gravy. but you can also avoid butter and add 2 tsp of fresh cream towards the end of preparing this gravy. 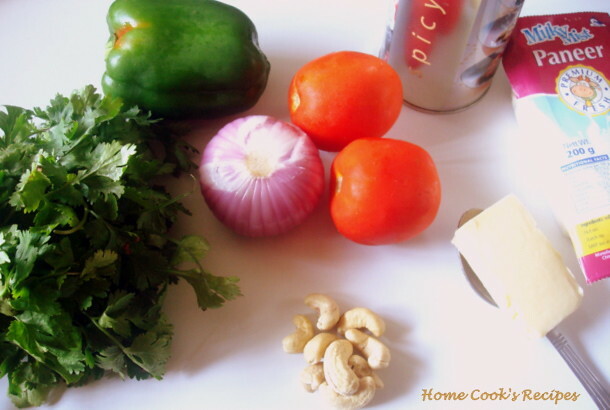 corriander leaves, capsicum, onion, tomatoes, chilly powder, paneer, butter and cashews. 1. Heat 1 tbsp of oil in a pan, add chopped onions and saute till it turns translucent. then add chopped tomatoes and saute till it turns mushy. add little salt and turmeric powder and mix well. switch off the flame.add corriander leaves and give a mix. cool the mix for grinding. 2. Add cashews to the onion -tomato-corriander leaves and grind them into a smooth paste. add little water to grind. 3. Heat 1 tbsp of oil in a pan, and fry the chopped capsicum's. after frying the capsicum's, add the grinded paste to the pan. add little water(as per the consistency you require) and let the gravy boil. add chilli powder and salt to taste. 4. 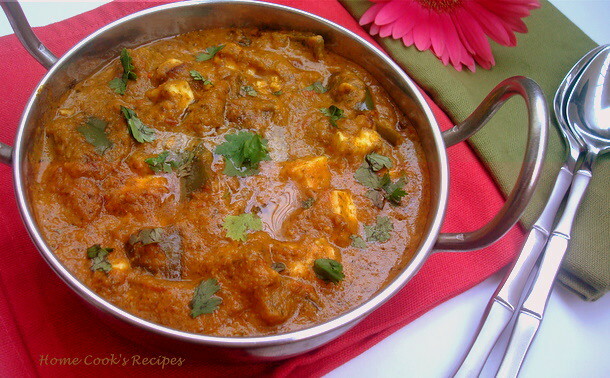 Chop the paneer into small cube's and add it to the gravy in the pan. add 3 tbsp's of butter & mix well. close the pan with its lid and let the gravy simmer for about 4 -5 minutes, till the oil emits on the sides of the pan. if not adding butter, switch off the flame and then add 2 tsp of fresh cream to the gravy. 5. 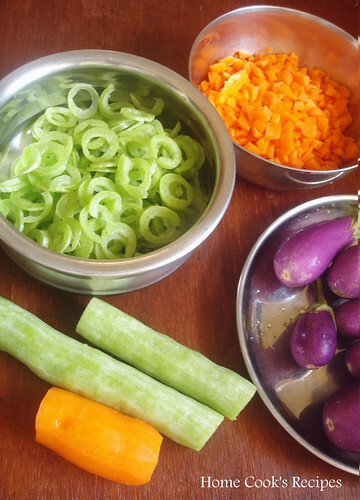 Garnish with corriander leaves and serve with chapathi or vegetable pulao. 1. I have used the paneer as such, without frying. If you are going to use fresh paneer, thats not frozen, you can add paneer without frying. 2. If you are using frozen paneer, de-frost it in your microwave on high for 1 minute. or put the paneer in a bowl of water for 15 minutes. 3.Dip the paneer in hot water for 2-3 minutes, which makes the paneer soft. 4. Some may not like the taste of corriander leaves, those can reduce the corriander leaves by half cup or completely avoid. but in this recipe corriander leaves is the only digestion freindly ingredient. I have said this recipe orally to many of my friends and everyone have tried and liked the recipe very much.﻿ I also prepared this for my son's birthday party and all my friends loved it. this post is specially for sundari, as she had been asking me to post this recipe here. sorry sundari for taking so much time. This is certainly a divine paneer dish. hope you all will try and enjoy this dish!! I very rarely buy or cook, Podalangai / Snake gourd. 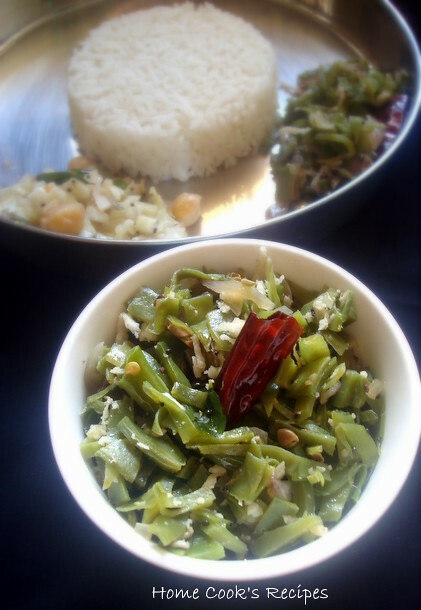 But after trying out Podalangai Kootu, it has become frequent at home. Its Such a simple recipe to try out. it tastes great too. Normally Podalankaai Kootu is cooked with Chana dal. But this kootu is with Moong Dal. Dry Roast the Moong Dal for 3 minutes. and Pressure Cook the dal with half cup of water for upto 3 or 4 whistles. Wash, de-seed and Chop the Snake Gourd finely. In a Kadaai, dry roast the cumin seeds, red chilli's and pepper. Grind the roasted ingredients along with grated coconut and little water. Heat a Pan, and add a tbsp of oil, add cumin seeds, curry leaves and fry the chopped snake gourd, till they are fully cooked, it may take upto 4 minutes to cook. 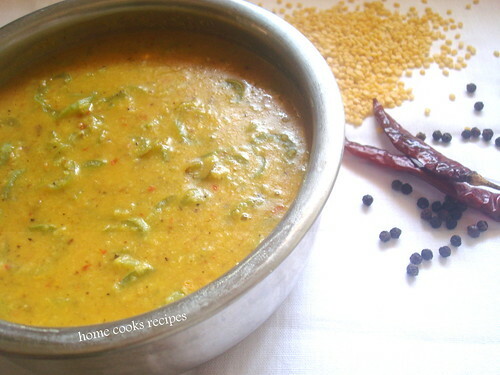 after the podalankaai / snake gourd is cooked add the cooked dal and mix well. and add the grinded coconut mix , a pinch turmeric powder, salt to taste and a cup of water and let the mix boil for few minutes. Switch off the flame and serve hot for Rice.